As we saw above, several of the message types include link state advertisements (LSAs), which are the fields that actually carry topological information about the LSDB. There are several types of LSAs, which are used to convey information about different types of links. Like the OSPF messages themselves, each LSA has a common header with 20 bytes, and then a number of additional fields that describe the link. The LSA header contains sufficient information to identify the link. It uses the subfield structure in Table 132 and Figure 190. LS Age: The number of seconds elapsed since the LSA was created. Options: Indicates which of several optional OSPF capabilities the router supports. Link State ID: Identifies the link. This usually is the IP address of either the router or the network the link represents. Advertising Router: The ID of the router originating the LSA. LS Sequence Number: A sequence number used to detect old or duplicate LSAs. LS Checksum: A checksum of the LSA, for data corruption protection. Length: The length of the LSA, including the 20 bytes of the header. For normal links to a router, the LSA includes an identification of the router and the metric to reach it, as well as details about the router such as whether it is a boundary or area border router. LSAs for networks include a subnet mask and information about other routers on the network. Summary LSAs include a metric and a summarized address, as well as a subnet mask. 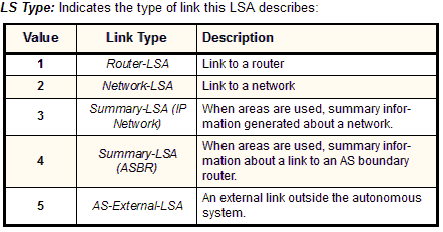 External LSAs include a number of additional fields to allow the external router to be communicated.